Domestic: A student who is an Australian citizen, a New Zealand citizen or the holder of a permanent visa. Overseas: Any student who is not a domestic student. students who transfer within the higher education institution from one course strain to another course strain, where the course leads to the same award (e.g. a student who changes from a BSc (Chemistry) to a BSc (Physics)). The successful completion of all the academic requirements of a course which includes any required attendance, assignments, examinations, assessments, dissertations, practical experience and work experience in industry. The conferring of the award for a course is not synonymous with and should not be substituted for 'course completion' as some students may have completed all the academic requirements of the course but not have received the award. A course completion occurs in those cases where a student is conceded an award after ceasing studies which would have led to a single award for a combined course (e.g. BA/LLb). In such cases, the course completion is for the course for which the completed units of study are counted as meeting its requirements. However, if a student is granted an award after partial completion of a combined course which normally leads to a single award, and then resumes studies of the combined course in the next year, a course completion does not occur. Where a combined course automatically leads to two separate awards, a course completion only occurs when the requirements of both awards have been satisfied. The completion, therefore, would be for the combined course only (and not two separate completions for two awards). Select cube from 'Selected Cube:' drop-down box. A data cube is a multi-dimensional data structure (typically three or more dimensions) and can be thought of as extensions to the two-dimensional array of a spreadsheet. The cube consists of numeric facts called measures which are categorised by dimensions. 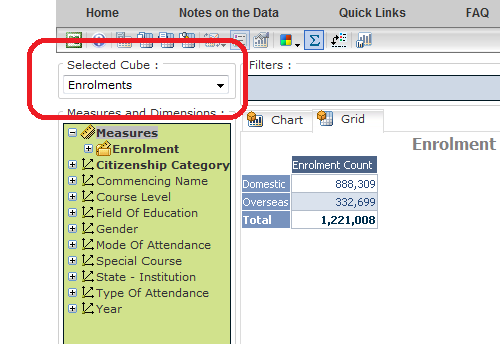 The Enrolments data cube (measure) is the default data cube selection. When the webpage is initially opened or if the webpage is refreshed, the default data cube will be automatically selected. The banner attributes the Australian Government Department of Education and Training as the author [and copyright owner] of the material contained in the website. Underneath the 'Selected Cube:' drop-down box is the Measures and Dimensions pane which lists the selected measure and the dimensions that can be dragged and dropped into the Columns, Rows or Filters panes. A maximum of five dimensions are allowed on an axis. Dimensions include Gender, State – Institution, Year etc. that the Minister determines is not an enabling course. Students who complete an enabling course would generally commence a course of study leading to a higher education award. Some students may not do so, but a course is not an enabling course if it is not being provided for the purpose of assisting the students to seek to undertake a course leading to a higher education award. the person is still entitled to continue with their studies and has not formally indicated before the census date that they have withdrawn from or deferred their studies. An EFTSL is a value representing the student load for part of a unit, unit or units of study, expressed as a proportion of the workload for a standard annual program for a student undertaking a full year of study in a particular year of a particular course. The field of education classification is used to describe higher education courses, specialisations and units of study with the same or similar vocational emphasis. 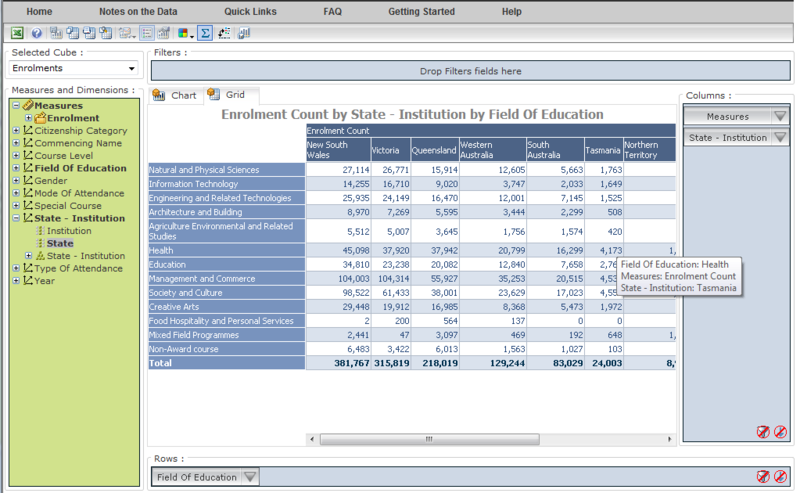 The data takes into account the coding of Combined Courses to two fields of education. As a consequence, counting both fields of education for Combined Courses means that the totals may be less than the sum of all broad fields of education. uCube classifies to the Level I grouping only. Natural and physical sciences is the study of all living organisms and inanimate natural objects, through experiment, observation and deduction. The main purpose of this broad field of education is to develop an understanding of the workings of the universe, and to extend the body of scientific knowledge. Information technology is the study of the processing, transmitting and storage of information by computers. The main purpose of this broad field of education is to develop an understanding of information systems, programming languages, information management and artificial intelligence, the ability to apply them to solve problems. Engineering and related technologies is the study of the design, manufacture, installation, maintenance and functioning of machines, products, systems and structures; and the composition and processing of metals, ceramics, foodstuffs and other materials. It includes the measurement and mapping of the earth's surface and its natural and constructed features. The main purpose of this broad field of education is to develop an understanding of the conversion of materials and energy, and the measurement and representation of objects, and the operation of plant, machinery and transport systems. Architecture and building is the study of the art, science and techniques involved in designing, constructing, adapting and maintaining public, commercial, industrial and residential structures and landscapes. It includes the study of the art and science of designing and planning urban and regional environments. The main purpose of this broad field of education is to provide an understanding of integrating structural and aesthetic elements in buildings, and construction methods, techniques and materials. Agriculture, environmental and related studies is the study of the theory and practice of breeding, growing, gathering, reproducing and caring for plants and animals. It includes the study of the interaction between people and the environment and the application of scientific knowledge to the environment to protect it from deterioration. The main purpose of this broad field of education is to develop an understanding of the management and use of natural resources, and the production of primary agricultural products. Health is the study of maintaining and restoring the physical and mental well-being of humans and animals. The main purpose of this broad field of education is to develop an understanding of the principles and practices of identifying, treating, controlling and preventing injury and diseases. It is also involves developing an understanding of the principles and practices of providing preventative, curative, rehabilitative and palliative care. Education is the study of the process of learning. It includes the theories, methods and techniques of imparting knowledge and skills to others. The main purpose of this broad field of education is to develop an understanding of the processes and methods of teaching and learning in pre-schools, schools, tertiary educational institutions and informal settings. Management and commerce is the study of the theory and practice of planning, directing, organising, motivating and co-ordinating the human and material resources of private and public organisations and institutions. It includes the merchandising and provision of goods and services and personal development. The main purpose of this broad field of education is to develop an understanding of the theory and practice of decision making and policy formation, organisational development, planning, financial management and the marketing and selling of goods and services. Society and culture is the study of the physical, social and cultural organisation of human society and their influence on the individual and groups. The main purpose of this broad field of education is to develop an understanding of human behaviour and interaction, beliefs and values, cultural expression, and social structure and organisation. Creative arts is the study of creating and performing works of art, music, dance and drama. It includes the study of clothing design and creation, and the communication of messages in a variety of media. The main purpose of this broad field of education is to develop an understanding of composition, performance, artistic production, choreography, design and creativity and technical production. Food, hospitality and personal services is the study of preparing, displaying and serving food and beverages, providing hospitality services, caring for the hair and body for grooming and beautification and other personal services. The main purpose of this broad field of education is to develop an understanding of the preparation of food and beverages, and the provision of hospitality services including housekeeping, cleaning and food and beverage service. It also involves developing knowledge of beautification and beauty treatments. Mixed field programs are programs providing general and personal development education. The main purpose of this broad field of education is to develop a basic understanding of reading, writing and arithmetic along with an elementary understanding of other subjects such as history, geography, natural science, social science, art and music. It also involves developing an understanding of key competencies and skills that are needed for job search activities, employment and personal survival skills. A member of staff who at the reference date has a full-time work contract in respect of their current duties, has a full-time equivalence at the reference date (FTE-RD) of 1.00. The FTE-RD for a member of staff who at the reference date has a fractional full-time work contract in respect of their current duties, will be less than 1.00. The fraction will represent the ratio between the number of agreed normal work hours for that person and the number of normal work hours which would be required of a member of staff having the same classification type and level as that person, but with a full-time work contract. For example, if a person with a fractional full-time work contract has normal work hours half those of a member of staff having the same classification type and level but with a full-time work contract, then the FTE-RD for the person would be 0.50. Normal work hours are to exclude paid or unpaid overtime work hours. The total FTE-RD for a person may be reported in fractional parts, each associated with work undertaken on different functions, or in different work sectors, or in different organisational units. The sum of these fractions would not exceed 1.00 in respect of any single substantive appointment. The FTE-RD for members of staff who are on paid leave at the reference date is to be calculated in respect of the current duties they would have were they not to be on leave. An organisation operating at one or more locations which was established for the primary purpose of promoting higher education and which conducts higher education courses. Idle time-out specifies the amount of time [in minutes] that a client session can be idle before the server cancels the session. The current setting is 20 minutes. An asterisk (*) indicates the default member. A classification which identifies the mode of attendance by which a student undertakes a unit of study. Where the student is undertaking a higher degree unit of study for which regular attendance is not required, but attends the higher education institution on an agreed schedule for the purposes of supervision and/or instruction. Unit of study for which the student is enrolled involves special arrangements whereby lesson materials, assignments, etc. are delivered to the student, and any associated attendance at the institution is of an incidental, irregular, special or voluntary nature. A unit of study is undertaken partially on an internal mode of attendance and partially on an external mode of attendance. If a student has all units internal then he or she is counted as internal. If all units are external then he or she is counted as external. If the student has a mix of internal and external units then the student is counted as multi-modal. but the unit, course or program is not being undertaken as part of a course of study, then the enrolment is on a non-award basis. Non-University Higher Education Institutions were formerly referred to as ‘private providers’. Lists of all institutions included in Higher Education Statistics can be found here (yearly from 2010). Units within a higher education institution which have as their primary objective the undertaking of teaching only functions, teaching-and-research functions or research only functions. Such units are referred to by various names, such as "schools" and "departments". The staff working within an academic organisational unit would include people undertaking or supporting teaching or research functions and in most cases would also include people undertaking other functions such as clerical and administrative work. If they are not classifiable as independent operations and if the higher education institution is legally responsible for them, field operations which enable teaching or research to be undertaken (eg farming operations, fishing operations, research operations) may be classified as being academic organisational units. Excludes organisational units undertaking teaching or teaching-and-research functions relating to continuing education or adult education (which are classifiable as "public service organisational units"). Under the Higher Education Support Act 2003, sections 179-5, 10, 15, 20(c) and the Privacy Act 1988, section 14 (IPP11), it is an offence to release any information that is likely to enable identification of any particular individual. The data cube (uCube) does allow customised tables to be produced with cells containing very small counts. The data cube does allow customised tables to be produced with cells containing very small counts. To avoid any risk of disseminating identifiable data, a disclosure control technique called input perturbation has been applied to the data, with the exception of grand totals, whereby small random adjustments are made to cell counts. These adjustments (otherwise known as noise) allow for a greater amount of detailed data to be released and, as such, do not significantly impair the utility of the tabular data for use in broad level analysis. However, the relative impact of perturbation is larger for small cell counts, which therefore should be used with caution. Where unperturbed figures are required, users should consult the Higher Education Statistics published on the department’s website. There are several ways to refresh the page. 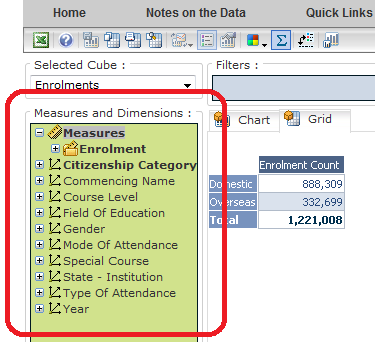 When you refresh the page the default table will display (Enrolment count by Citizenship Category [for the latest year]). The Higher Education student data collection encompasses enrolments, equivalent full-time student load (unit of study data) and completions, and is reported by all higher education institutions. Details of the data elements reported by higher education institutions are published here. The Higher Education staff data collection includes information on the numbers and full-time equivalence of staff and is reported by all public universities as well as The University of Notre Dame Australia, Bond University, University of Divinity (formerly MCD University of Divinity) and Avondale College. Students undertaking courses for initial registration as nurses. Students undertaking courses providing initial teacher training. Students undertaking courses leading to provisional registration as a medical practitioner. A course leading to provisional registration as a veterinary practitioner. A course leading to provisional registration as a dental practitioner. A course leading to provisional registration as a clinical psychologist practitioner. Not undertaking a course of special interest. The body of teachers or lecturers of an educational institution, as distinct from the students. A person for whom there is an enrolment in a higher education course. The tool bar allows quick access to the data cube options via icon buttons. An icon description displays when the mouse cursor is positioned over an icon. Use this button to export your customised data table to Excel. Use this button to open the help file. Use this button to save a chart — note this only works when you are in the chart view. Use this button to copy the data from the grid and paste it into another program, such as Word or Excel. Use this button to print the customised data from the grid. Use this button to preview the customised data from the grid before printing. Use this button to change the chart type — note this only works when you are in chart view. Use this button to change the position of the legend — note this only works when you are in chart view. Use this button to open up the properties for the chart — note this only works in chart view. Use this button to change the colours in the chart — note this only works in chart view. Use this button to show or hide the totals in the grid. Use this button to pivot the data in the grid. Use this button to open up a simple view, with no field boxes showing. Full-time: Student load aggregated for all the courses being undertaken by the student in the Collection Year is 0.75 or more. Part-time: Student load aggregated for all the courses being undertaken by the student in the Collection Year is less than 0.75.